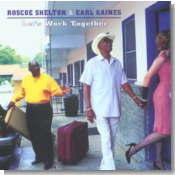 Nashville soul/blues legends Roscoe Shelton and Earl Gaines keep getting better with age. For some wonderful soul crooning, check out their new album on Cannonball Records, this month's Pick Hit. Lovers of classic Chicago blues piano will not want to miss the brand new one from 76-year-old Henry Gray, Plays Chicago Blues. It's our April Surprise feature. There just weren't many blues singers as soulful and expressive as Chicago's Magic Sam. A re-issue of his great Cobra and Chief recordings is featured in this month's Flashback selection. This month's What's New section features an unprecedented number of reviews of CDs, including new ones from Michael Burks, The Holmes Brothers, Maria Muldaur, Oscar Toney Jr., Joe Beard, Big Bill Morganfield, Luther "Guitar Junior" Johnson, Lucky Peterson, and more. A special bonus this month is reviewer Mark Gallo's special feature on the current Detroit blues scene.